Calling all graduate students and early career professionals working in history of medicine and public health in the NY region. Please join us for an evening roundtable and reception to gather, mix, and collaborate on the evening of Thursday, April 10, 2014. Our program will begin at 6 pm with an introduction to The New York Academy of Medicine’s Center for the History of Medicine and Public Health and its resources, followed by a series of short presentations by professors, archivists, and curators in the New York City area, and an open table discussion about access to materials and opportunities for collaboration. Please join us afterward for a wine and cheese reception and a tour of the Academy and its collection. RSVP to 212-822-7301 or smoloney@nyam.org. 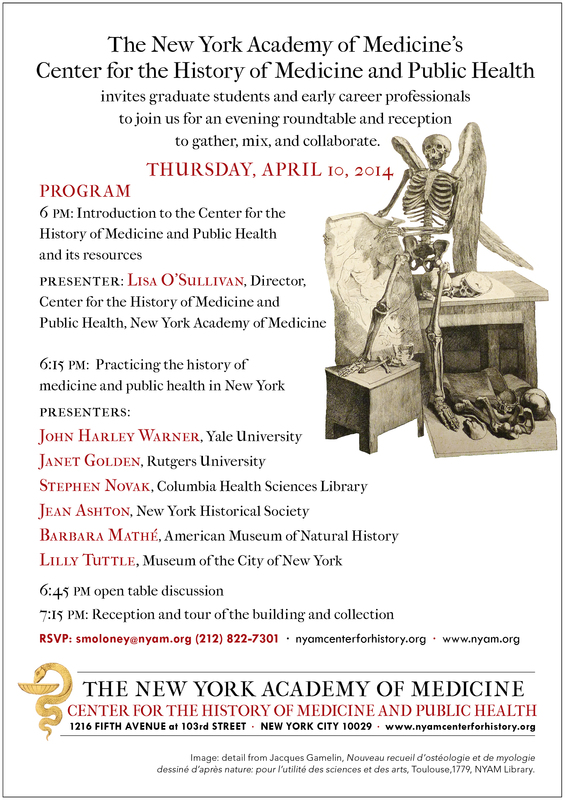 This entry was posted in Events, History of medicine and tagged event by nyamhistorymed. Bookmark the permalink.